Think waterfront dining is only for coastal towns? Think again! 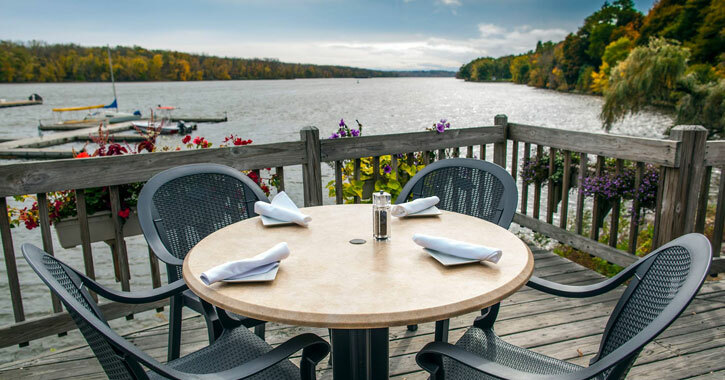 You can find a number of restaurants situated right on the Hudson River, Mohawk River, and even a beautiful lake you might not have heard of. Have you heard of Crystal Lake? This picturesque body of water is located in Averill Park and you can enjoy the views from the deck at Lakeview on Crystal Lake. The restaurant is housed in a historic building that dates back to the 1800s. This restaurant is ideal for a family dinner or a casual lunch with a friend. The menu offers a wide variety, with tastes to suit nearly everyone - you'll find pizza, prime rib, seafood, sandwiches, soups, and much more. 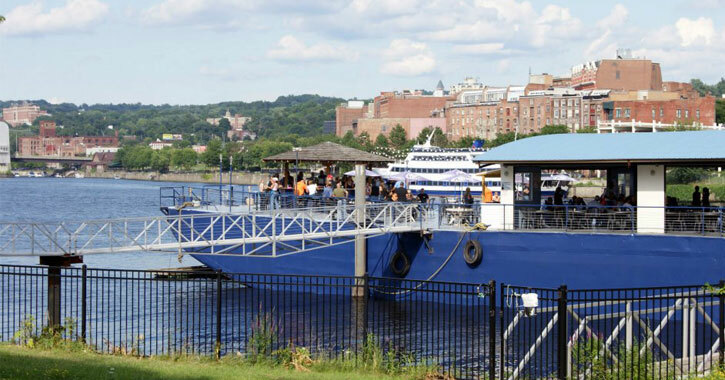 When you dine at The Rusty Anchor Bar & Grill in Watervliet you'll be aboard a 200-foot-long barge in the Hudson River - this really takes dining waterside up to the next level! The Rusty Anchor serves up delicious summery fare when in season, with burgers, sandwiches, wraps, and a number of seafood options: a fish sandwich, fish and chips, lobster BLT, and a lobster roll. 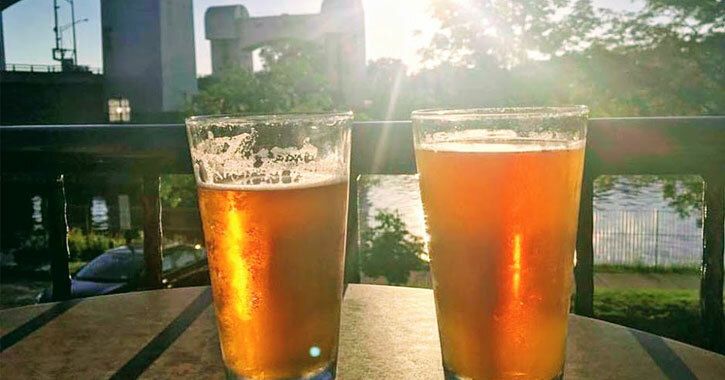 Brown's Brewing Company is a Troy hotspot for delicious, independently brewed beers, fantastic food, and stunning views of the Hudson River. 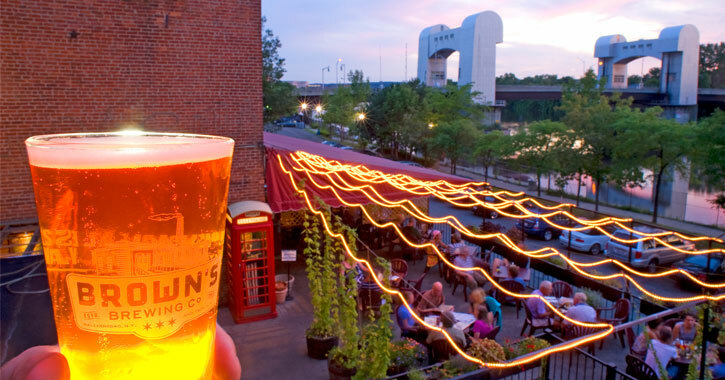 In business since 1993, Brown's Brewing is situated in a former warehouse on River Street and consists of a brewery, taproom, and restaurant, and they're also a hotspot for live music in the summer. 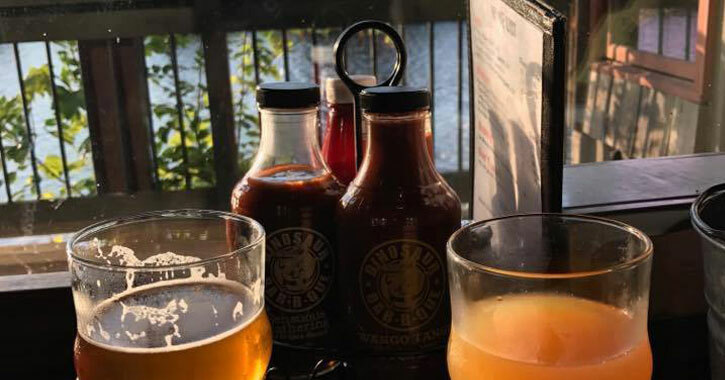 In fact, Brown's Brewing actually gives you two opportunities to enjoy waterfront dining - at their Troy location, and at their second taproom in North Hoosick. The Walloomsac Taproom and Brewery overlooks the Walloomsac River, about an hour away from Albany, close to the Vermont border. You'll find Ryan's Wake on River Street in Troy, right near Brown's Brewing. They serve up high quality pub food, with a variety of burgers, hot dogs, fries, and more. These classic dishes come in fun varieties like The Rodeo Burger, with barbecue sauce, bacon, cheddar, and crispy fried onions, or the Chihuahua Hot Dog, with nacho cheese and jalapenos. It's right in the name: Dinosaur Bar-B-Que serves up some delicious barbecue! They might be best known for their slow smoked pork ribs, although they have an extensive menu. You can get amazing sandwiches like barbecue pork and barbecue brisket, as well as a "pick your own combo" option, wherein you can enjoy a combination of pork, brisket, chicken, wings, shrimp, and/or sausage. Dinosaur Bar-B-Que is located by the Hudson River, right by the Green Island Bridge in Troy. As with Brown's Brewing, they're also one of the best restaurants in the area for not only waterfront dining, but live music as well. Check out their Facebook page for events going on! There is just something special about eating seafood outdoors by the water. 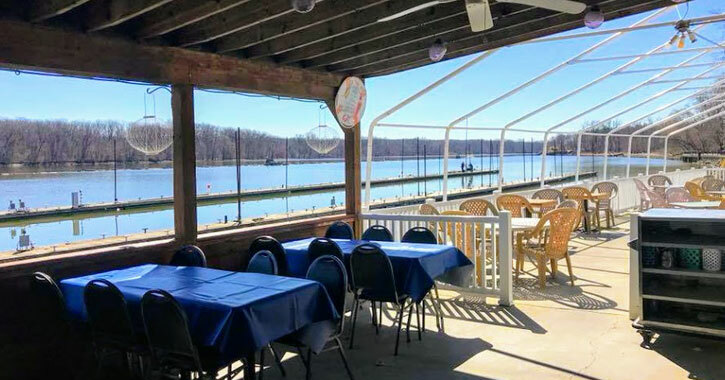 If this sounds good to you, make a plan to stop by Yanni's Too, which is located right on the Hudson River in Ravena, a little over 20 minutes from Albany. They're known for having some of the best seafood in the Capital Region, particularly the calamari. Not a seafood lover? They're also touted for their amazing barbecue ribs. Or, simply enjoy a cocktail by the water. 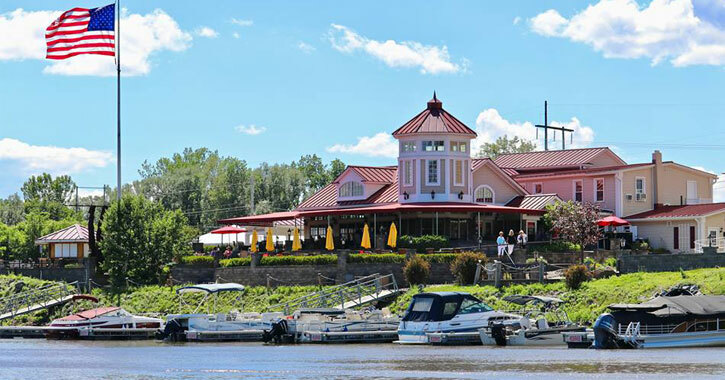 The Boathouse Grille is located on the Hudson River in New Baltimore, less than half an hour from Albany. 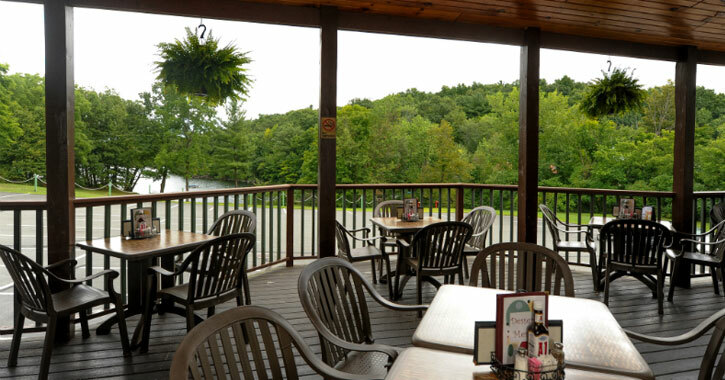 They serve casual and delicious fare in an absolutely gorgeous setting. Think roasted vegetable pizza, barbecue pulled pork sandwiches, and build-your-own burger, and those aren't even the entrées! Main meals include chicken or veal marsala, prime rib, and linguini and clams. Photo credit: Bizi Media Co. The Waters Edge Lighthouse is situated in the oldest building in Glenville, about 30 minutes from Albany, and it overlooks the beautiful Mohawk River. They pride themselves on exceptional service in addition to offering one of the best waterfront dining locations in the area. You can enjoy everything from fresh seafood to NY strip steak to a braised lamb shank, and more. They also offer a light fare menu, a gluten-free menu, and vegan cheese is available for a number of dishes, making this a really versatile restaurant with tastes to please any palate.